Good article from The Verge about how they GE tests jet engines to ensure that they can withstand bird and hail strikes. The obvious next thing to test is small drones. Peebles is home to GE Aviation’s Peebles Test Center. Sitting outside "Disneyland for geeks" is a crumpled white car with a sign next to it: "Don’t text and drive." It’s a real car that really crashed when its driver was texting, says Brian De Bruin, the plant leader at Peebles ("If this is Disneyland for geeks, I guess that makes me Mickey Mouse," he says later). Texting and driving is a common problem in rural Adams County, Ohio, the home of the 7,000-acre reserve that tests 1,600 engines a year. The state-of-the-art facility is located in the middle of nowhere to avoid noise pollution. Hawks lazily float on air currents above us, apparently unperturbed by the occasional sound of engines. Peebles was initially opened in 1954, and was intended to test rockets, though that never actually happened. It acquired its modern function in 1965, when GE ran its first test of the TF39 engine there that would eventually power the Air Force’s Lockheed C-5 Galaxy transport aircraft. Security is tight, though the guards are friendly — I arrive a little early and am directed to wait for Jamie Jewell, the spokeswoman for CFM, GE’s joint venture with French company Snecma (which startles me every time someone says it aloud — I cannot help but hear the mondegreen "smegma"). Jewell arrives with De Bruin, and we all pile into a minivan. I am very much hoping that I will be able to witness engine tests, but first, Jewell and Chris Nye, marketing manager for Leap, walk me through a video of the brand-new Leap engines — turbofans that will find their way into next-generation midsize airliners from Airbus, Boeing, and China’s COMAC. 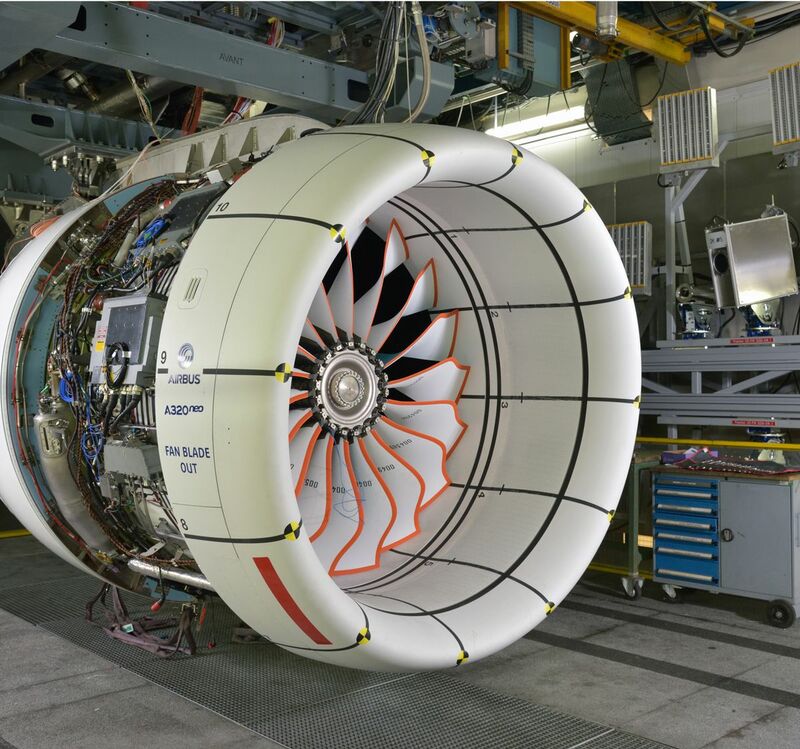 When manufacturing is going full-tilt, one engine will be built every 5 hours. The Leap testing, conducted primarily at Peebles, is meant to be complete by the end of this year. There are, of course, the FAA standards — and meeting them means that GE engines are cleared for Europe and China as well. There’s the over-torque test and teardown inspection, meant to give regulators an idea of the wear and tear the engines may face during their lifetimes; during these tests, the engines experience extreme conditions, meant to determine their durability. There’s the vibration test and the corrosion test; the thermal fatigue test and damage tolerance test; the crosswinds test and acoustic tests. Then there are the fun tests: birds, volcanic ash, dust ingestion, and hail. But Leap is still undergoing certification testing, the bulk of which is expected to be done by the end of this year. They’ve already finished the bird test and another test, the "blade-out," which I think I like even better than the bird test. Here’s what a blade-out is: a thumb-sized amount of the explosive C-4 is attached to a blade’s base. Once the engine is running at full power, the C-4 explodes, knocking out the blade. The test is to show the engine can contain the lost blade — no one wants it to go careening into the passengers onboard the plane — and that the engine won’t catch fire. It’s De Bruin’s least favorite test because it destroys the engine. "That makes me sad," he says. The engines have to be durable enough to stand this kind of rough treatment, but they also must be light. Engines are, of course, hung under the wing — where they create drag, so engines must generate the needed thrust to get the airplane off the ground while minimizing weight penalties — the thrust-to-weight ratio is seven to one on the Leap engines. And the heavier the engine and the plane, the more fuel it burns. Fuel is expensive, accounting for more than a quarter of airlines’ operating costs — the single largest cost most airlines have. In the interest of saving weight, GE uses 11 miles of carbon fiber woven into each of its Leap blades, like a T-shirt woven on a loom, with a titanium leading edge. That’s for the birds — it’s essentially a knifeblade. The engine also boasts ceramic components to improve fuel performance and 3D-printed fuel nozzles. There is a great 3 part vid on YT about the making of the Rolls Royce jet engines - they actually blow up some explosives inside it to see what happens. We've been flying a long time now but I still say that these airliners represent the culmination of everything that is great about "making stuff". It's the ultimate engineers art! Chris, you fail at click bait by putting the answer in the subject of the post! hahahha! Damn. Will try harder at obfuscation next time. "First they shot dead chickens at jet engines. You won't believe what came next..."
I remember my dad telling me stories about working on these tests. One engine exploded on the stand and the compressor stage ended up on the roof of someone's house in Peebles, OH. Well will these engines withstand a medium size drone like a Solo or DJI Phantom? It's my understanding that there has not been a single reported incident of any size drone actually hitting any type of commercial or private aircraft? Is this accurate? If so why is there so much fear mongering regarding this issue. there are so many stories that one would think that drones are crashing aircraft on a daily basis?